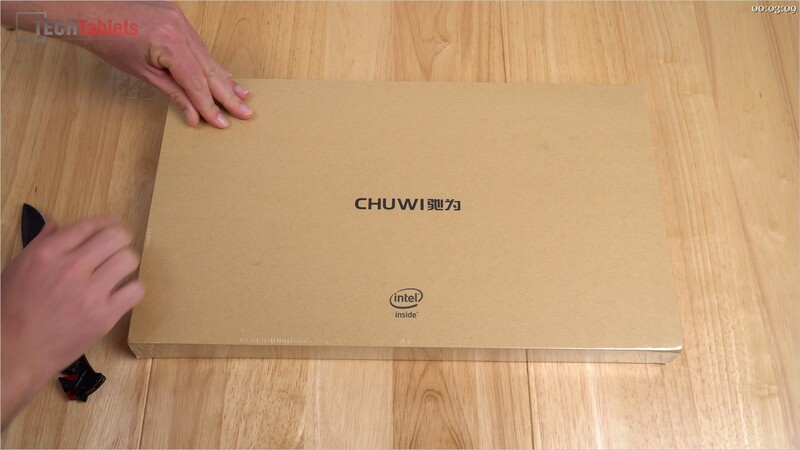 Chuwi’s one of the few Chinese tablets manufacturers out there always looking to put the best screens and 3:2 ratio ones in their tablets, well them and Cube. The Chuwi Hi13 continues on with a 3:2 ratio screen like the popular Hi12, but this time around the screen size has increased from 12-inches to 13.5-inches and a resolution of 3000 x 2000 pixels. The PPI or Pixels per Inch is 267, meaning it’s a sharp screen and max brightness tops out at 498 Lux which is also very decent. Sounds like a great screen right? 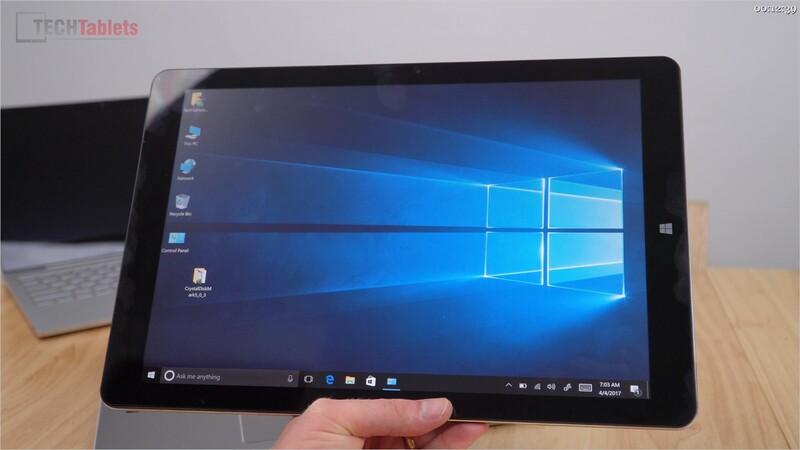 Well, it is in fact the same IPS panel used in Microsofts Surface Book. Sadly there is no Dual OS support now, so it runs only Windows 10 Home. 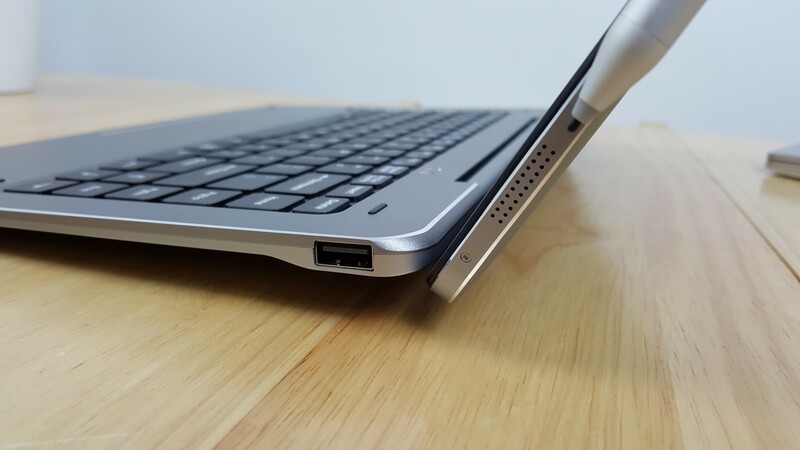 And we lost the USB 3.0 and USB 2.0 full sized ports the Chuwi Hi12 has. So a top screen with great brightness, contrast and with good blacks. 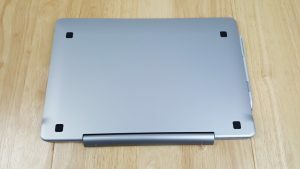 sRGB 100% coverage, but while it might be the same screen as used in the Microsoft Surface Book it doesn’t look as good due to two factors, it’s not fully laminated. So there is a gap of 1mm between the digitizer glass panel. 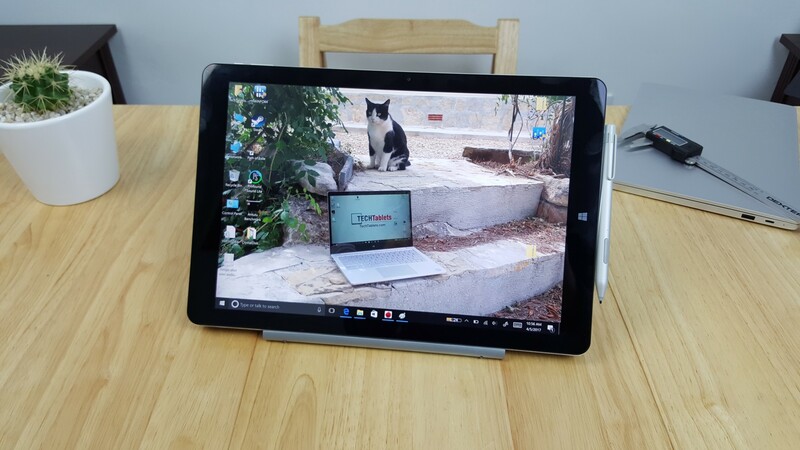 And It comes with a pre-applied screen protector because it isn’t Gorilla Glass like the Surface Book, but plain old soda lime glass, prone to scratching easily. And it’s very prone to reflections. 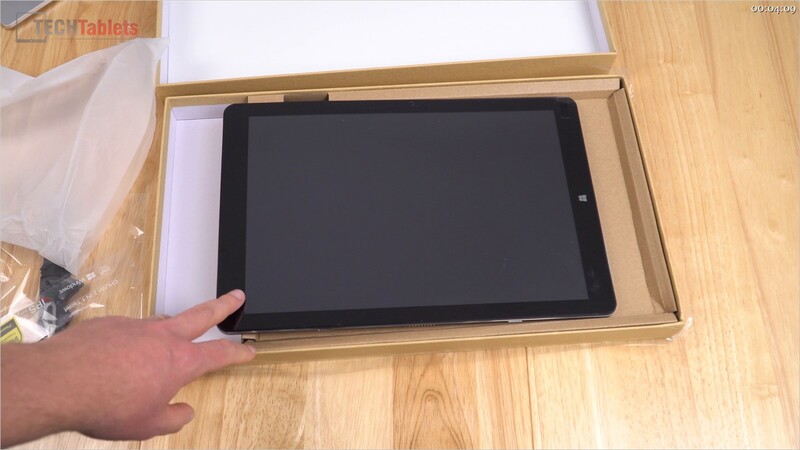 13.5″ 3000 x 2000 IPS/PLS panel with glass Goodix touch digitizer. Full working recovery partition can be factory reset just fine. Optional Goodix 1024 level pressure sensitive stylus with 2 buttons and top eraser feature. 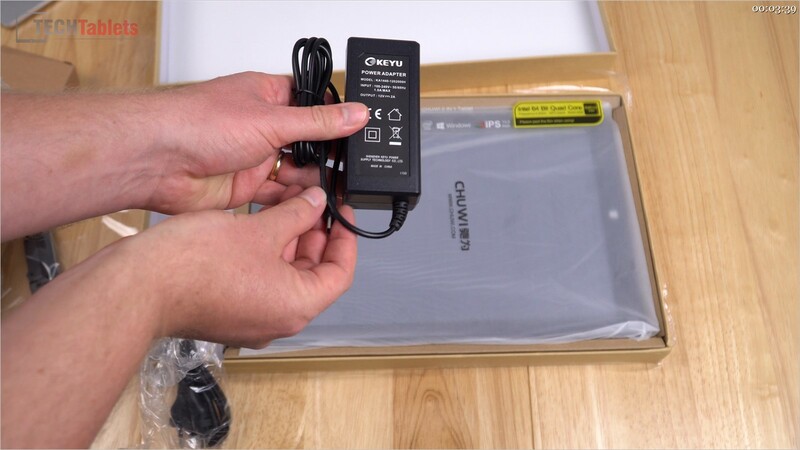 Below images show the typical Chuwi packaging and the power adapter that’s rated to 12 volts 2 Amps. 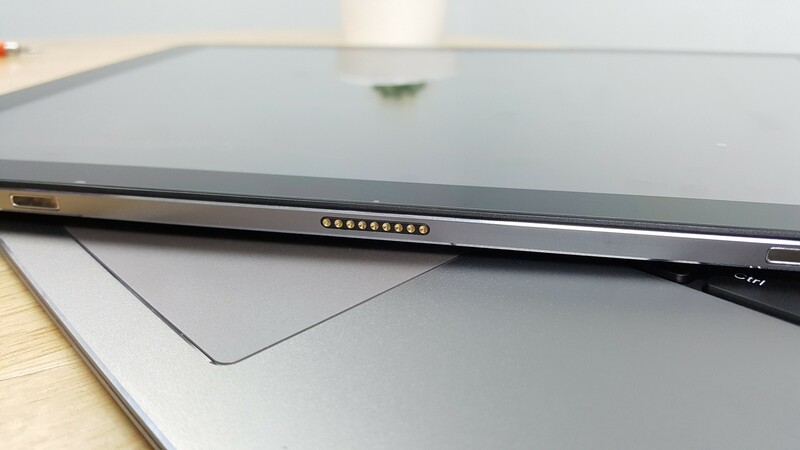 Note that all Quick charge 3.0 12 volt and 12v power banks tested do not charge this tablet and the MicroUSB 2.0 port is strictly data only, no charging. Oddly, Chuwi includes a USB to type-C cable for data, but clearly not charging. Note: No adaptors are included for the Type-C and MicroUSB port. This is an oversight by Chuwi and should have been included. Like almost all the tech I review, I bought it. So not a free review unit. Therefore I’m able to speak my mind, give an honest review without worrying about losing future free review units. What about the build quality? 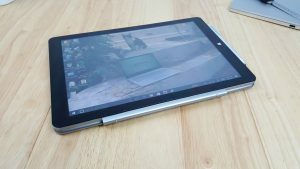 It’s very similar to the Hi12, HiBook and other Chuwi tablets. A unibody rear housing made from aluminium in silver only (No ugly gold here!) 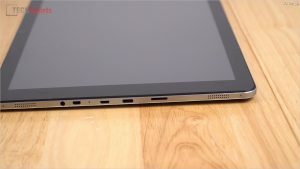 Sadly this tablet is missing a very handy full sized USB port. It has a Type-C port (USB 3.0 spec) and MicroUSB 2.0 port, both require adaptors (Not included!) Micro HDMI, Micro USB 2.0, 3.5mm jack and a full speed MicroSD card slot. The front glass and black plastic frame are screwed and clipped into place on the Hi13 with 4 x T4 TORX screws to hold it in place. While this works fine, I notice that around the front where the two halves meet it’s possible to hear some flex when applying pressure. 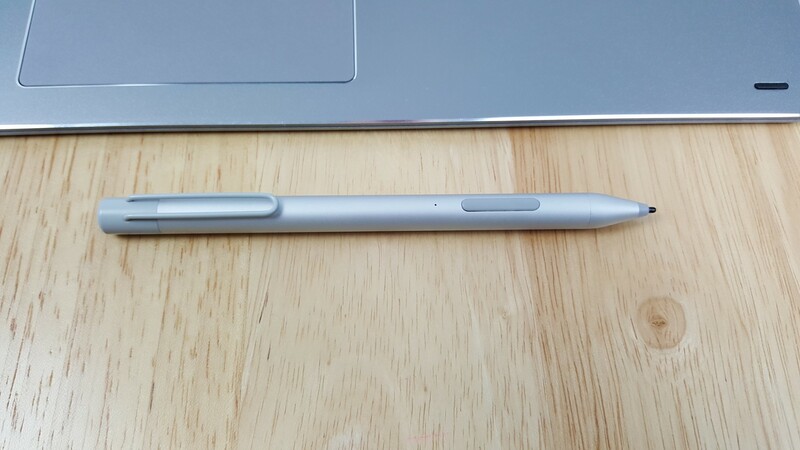 Overall the build quality is decent for the price, just don’t expect Surface Book finish quality. 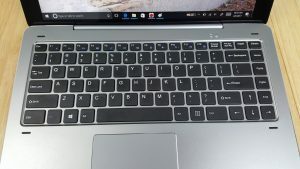 The Hi13 keyboard is very similar to the Hi12’s second generation keyboard. But larger than the Hi12’s to accommodate that larger screen. 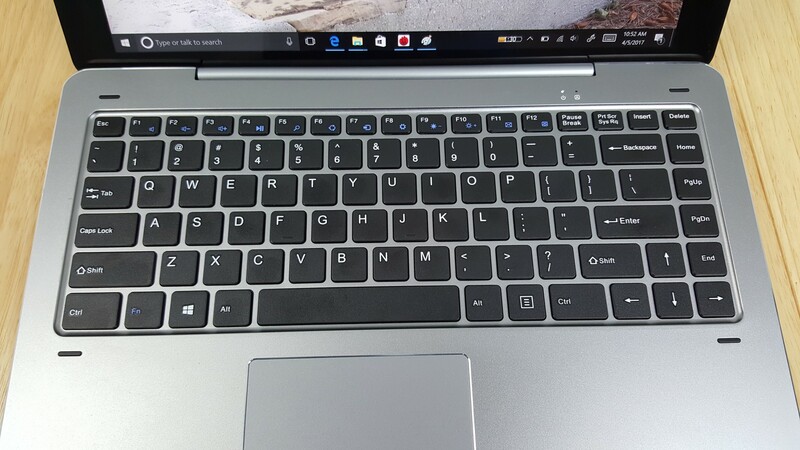 The keyboard has shortcuts for media, screen brightness, print screen and all your page up/down, end and home keys. I measured the key travel to be more or less 2.0mm. Not as much as the Lapbook’s 2.2mm but good to type on very firm. It is a little loud as sound tends to travel through the keyboard when you’re hammering out an email etc. The underside of the keyboard is made of a rubberised matte silver finish and is made of plastic. The whole top of the keyboard is metal giving it a quality feel, a stark contrast to the first gen Hi12 all plastic keyboard. I measured the key travel to be more or less 2.0mm. 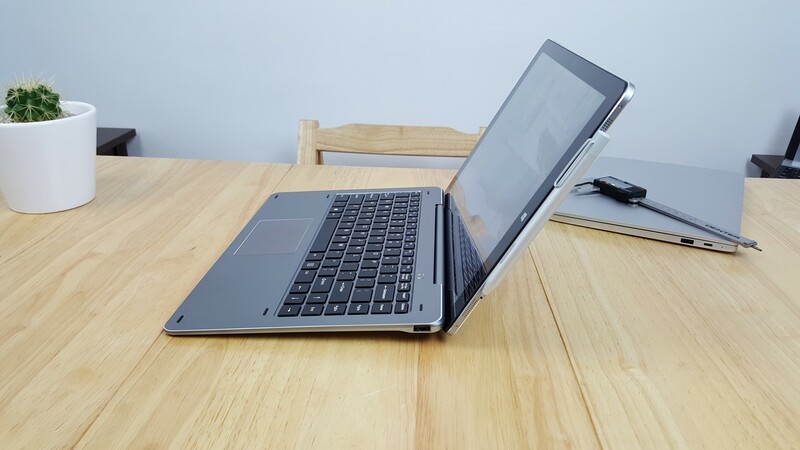 Not as much as the Lapbook’s 2.2mm of key travel but good enough to type on and the keyboard is very firm with little flex. It is a little loud as sound tends to travel through the keyboard when you’re hammering out an email etc. The underside of the keyboard is made of a rubberised matte silver finish and is made of plastic with four rubber feet. The whole top of the keyboard is metal giving it a quality feel, a stark contrast to the first generation Hi12 all plastic keyboard. 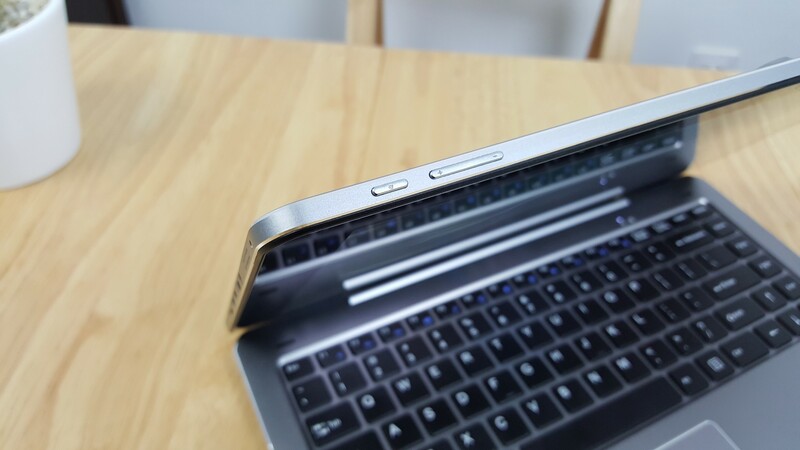 The keyboard mechanism is made of metal and the hinge is stiff, firm enough to support the tablets 1.1 kilos of heft. It doesn’t latch in place but is rather held in place with magnets. 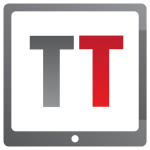 The touchpad is reasonably sized and accurate. 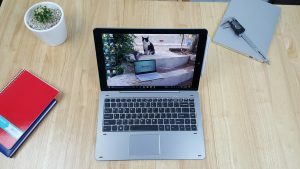 It does the job, but nothing like the touchpad on my Surface Book and Mi Notebook. I often trigger that stupid swipe down to minimise Windows gesture making this touchpad annoying to use at times. 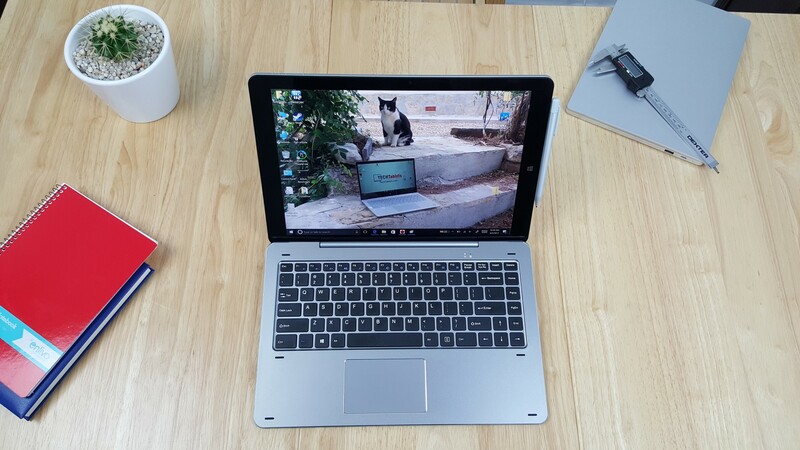 So it supports gestures and has the left and right mouse buttons incorporated within the touchpad. They are a little noisy those mouse buttons with a louder than normal click to them. The keyboard also has two USB 2.0 ports left and right. 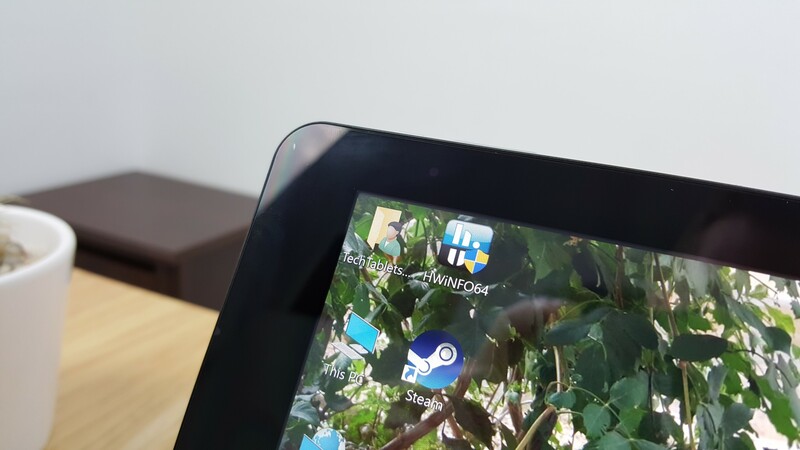 And the tablet can be flipped around and used in the dock, so the dock keyboard acts as a stand for the tablet. Since the pogo pin is a 10 pin one, the USB ports in the keyboard will work when inverted which is a nice touch. Accuracy is good (as seen in my video review) pressure sensitivity and palm rejection work fine. 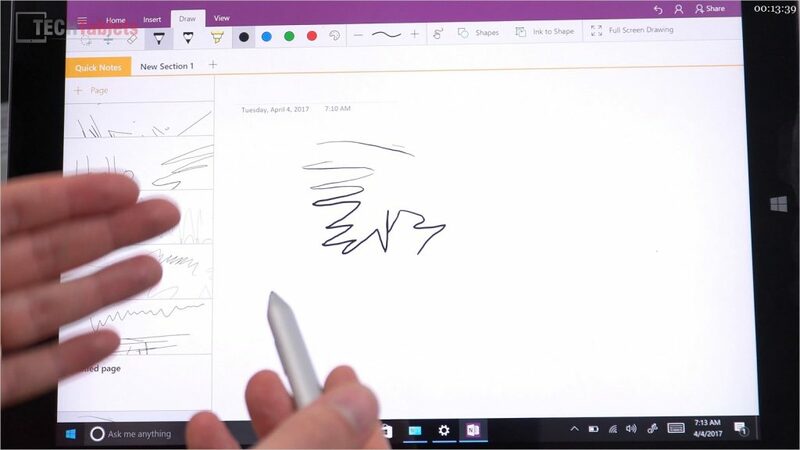 Sketching with the stylus is okay, but not at the level of my Surface Pro 4 with its rubber tip and fully laminated screen. The tip of the stylus is made of plastic, but not as hard as the WACOM Cube or Hi12 HiPen H1’s tip as a result so far using it it has not scratched the screen protector. 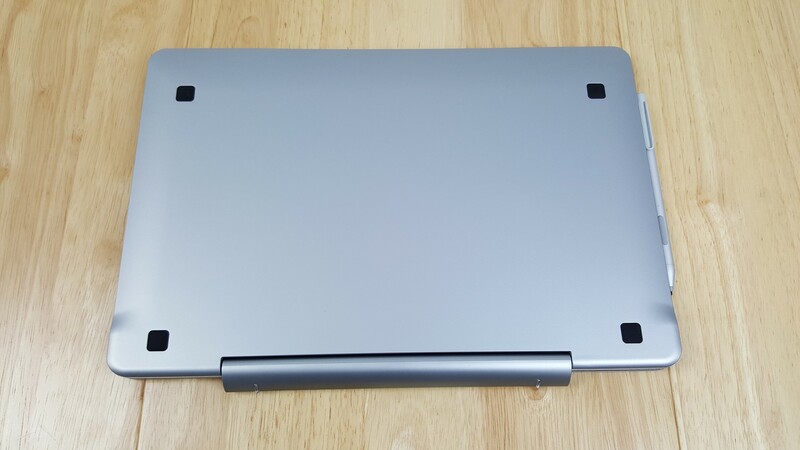 Magnets on the side of the tablet hold the stylus in place firmly. So you can place it there when not in use. The Hi13 feels for the most part quick and snappy, there is at times some lag when tapping the start menu. 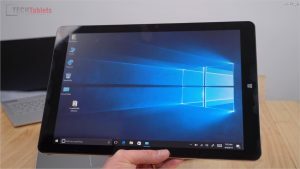 I believe this is mostly because the GPU is driving a 3000 x 2000 resolution screen which is more demanding than the typical 1920 x 1080 screens as seen on other Celeron N3450 tablets or notebooks I’ve reviewed. The Intel HD GPU is where Chuwi has worked a little magic, they have dedicated 600Mb of RAM permanently to the GPU so free RAM is a little less than most 4GB Apollo Lakes without that extra dedicated to the GPU. But it has made quite a difference when playing games for example or any intensive task requiring more from the GPU. Frame rates are some of the best I’ve seen from this chipset. But it’s not just due to that extra dedicated RAM, they have applied a few other tweaks in the bios level I believe. 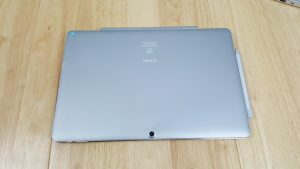 The bios advanced settings are locked out to the end user, secure boot is disabled and Manjaro Linux version 17 booted and everything working fine including wireless and touch. Edge performance is great, smooth scrolling and 4k streaming are possible. Chrome works fine but is a little slower and 4k just drops too many frames to be practical. HEVC 10bit files up to 100Mb play fine on the Intel 500 GPU which natively supports it. Apollo lake supports H.265/HEVC natively via hardware. 4k via the micro HDMI port maxes out at 30hz. So as a result is choppy and slow. Only good for watching a 4k film on a 4k TV, but not for desktop use. A refresh rate of 30hz is just too slow for that. 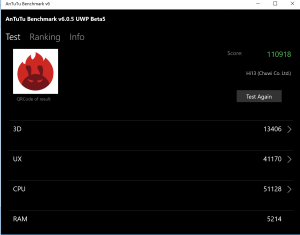 Benchmarks were all good for the chipset, some of them are below. 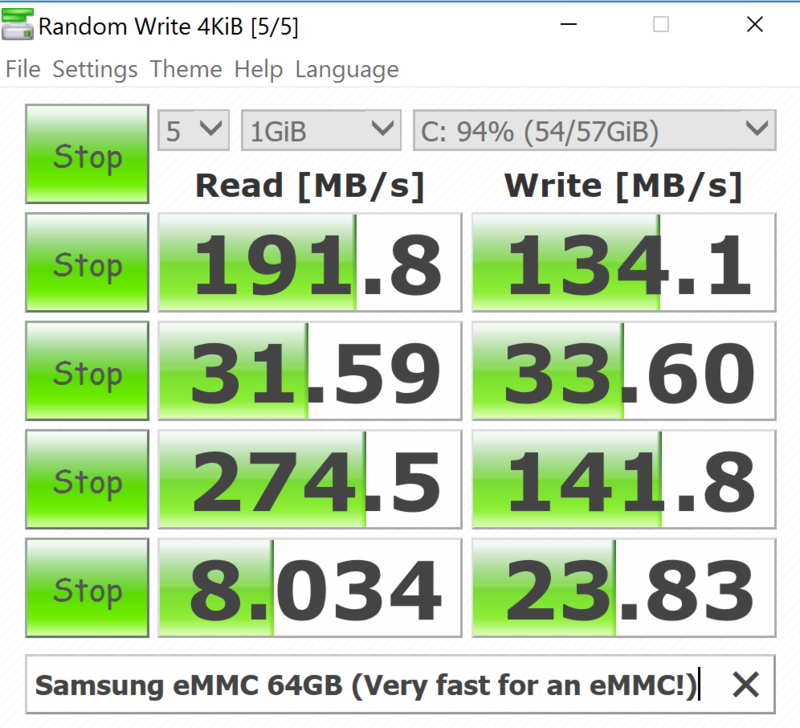 eMMC speeds are great, very good for an eMMC. You get 43.5GB on first boot free on the drive, which isn’t a lot of space to play with. 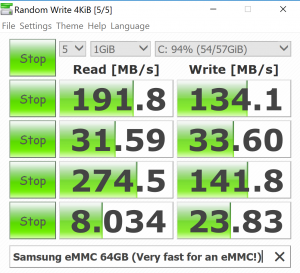 There is no SSD expansion on this model unlike the Chuwi Lapbook 14.1. It would seem Chuwi doesn’t want us opening it up. 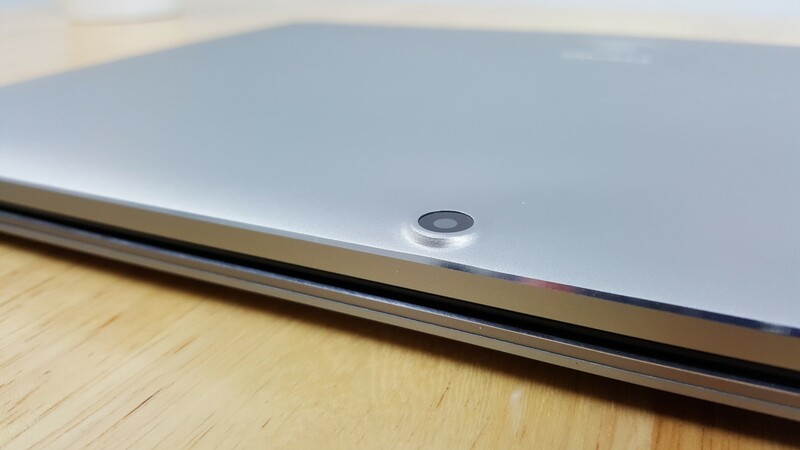 (See the Hi13 internals here) The Type-C port works at full USB 3.0 speeds and all ports including the docks can power an external hard-drive. The Hi13 uses a decent wireless chipset, an Intel 3165 Wireless AC chip and has dual antennas. As a results speeds are great, much faster than RealTek wireless N in the Hi12. My unit was able to get almost the full 300Mbps speed my fibre optic line has in the studio. Only top of the line wireless cards can reach my full line speed as good as my desktop plugged directly into the modem. Wifi range is also good, not amazing, but around my house (2 floors) and the studio I haven’t experianced any issues like drop connections or slow transfers. The Intel 3165 chip range is a massive step up from the single antenna wireless N solutions in the old Atom Cherry Trail. The Hi13 has 4 speakers, on each corner facing outwards. They sound flat and lack volume. But you can use programs to help increase the volume and quality. See this thread in the forum (Increase Hi13 speaker volume), it’s for the Hi12 but same applies here. But overall disappointing poor speakers! 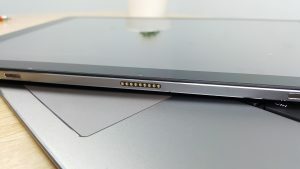 The microphone located on the left side and has some static over it (front web camera sample in the review video) The 3.5mm jack also suffers from some type of static or interference from the CPU. Possible lack of shielding around the port and RealTek audio chip? 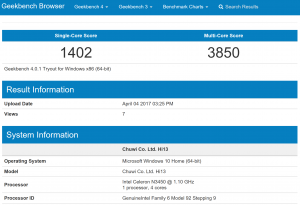 Chuwi Hi13 Battery Life & Charge times. 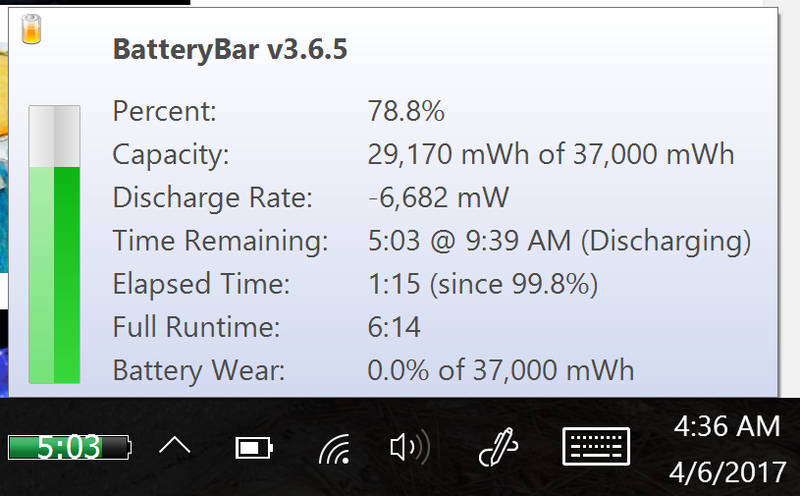 Note: Windows IS detecting the battery capacity correctly! 37Wh, I got confused at the time of the video review because other 10000mAh Apollo lake tech reported higher capacities. Sadly not as good as I had hoped for 6-7 hours use using Edge and Chrome multitasking with 40% brightness. That same use on the Hi12 would still give you around 9 hours at least, but we do have a larger higher resolution screen to drive. And RAM is now dual channel accounting for even more power consumption. And the Apollo Lake does use more power so maybe my expectations were too high? Will it make it through a full day? It’s really dependant on your screen brightness and what you’re doing. Gaming and 100% brightness it will only last about 3 hours. 25% brightness and light tasks you should be able to squeeze out 8 hours out of the Hi13. It takes approximately 5 and 1/2 hours to fully charge and once at 100% if plugged in will stay there or sit at 99% and not drop when in use. Unless you do something very demanding like gaming with 100% brightness. Thermals are good, in the video where I opened up the Hi13, I discovered that Chuwi used a copper heatsink on the SoC and later thermal pads. As a result, the max temps after one hour of gaming are perfectly fine, no thermal throttling and not high enough I feel to warrant a copper heatsink mod. The rear of the tablet gets slightly warm to the touch about 33 degrees. Max temps after 1 hour and 30 minutes of gaming: CPU: 82 Degrees C & GPU 89 degrees C.
Linux Manjaro boots fine from a USB Pen and everything works. 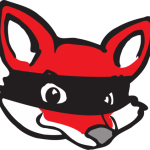 The version tested was 17.0.1 stable. 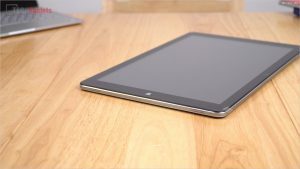 The Hi13 is a great tablet, certainly not for everyone at 13.5 inches weighing 1.1 kilos. 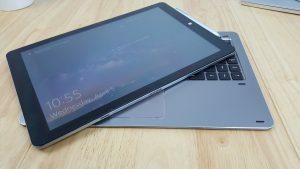 It has a top of line premium screen, good performance for the chipset and the stylus works okay as long as you’re not asking too much from the chipset trying to edit 30 layers in Photoshop. It’s only really let down by two things, poor audio and average battery life. Oh and the lack of a full-sized port on the tablet is another con. At least on the keyboard dock there two full-sized ports, but it’s only USB 2.0 spec. So should you get the Hi12 instead of this? Only if you don’t need the extra power, want dual boot and prefer 1-2 hours more battery life. The Chuwi Hi12 is also cheaper at $239 if you’re on a budget. But the Atom Z8300/Z8350 is a real step down in performance and the wifi is much slower. Is there going to be a newer version of this tablet? I’m thinking of buying one but it’s over a year old. If Chuwi manage to trim the weight at under 1 kilo, then I would definitely buy one. 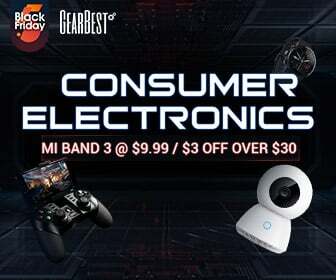 Now you can buy Chuwi Hi 13 @ Banggood for 271.99 usd by use coupon 20 % off. Can you explain why Linux Manjaro is booting, and ubuntu is not ? Ubuntu support is officially p[romised by Chuwi. But i can not boot it in Ubuntu: only a black screen with a little dash. Can you hgelp me? I wrote a blog about it, please write some comment. there is also cube mix plus for 310 dollars on gearbest right now, but i really like the screen size of chuwi surbook! thank you very very much for your hard work, i wouldn’t have known about these tablets if it wasn’t for you! 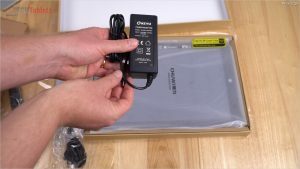 I’m surprised by no other power supply or power bank charging via the USB-C, as all the marketing media says USB-C which supports Audio/Video and Charging, unless it’s just bad wording and they mean the included AC Charger just happens to use the USB-C port, but runs at a power rating that other chargers don’t meet. But even then, it’s a 24 Watt charger? And you have that 75W one you mentioned worked with the Cube i7 Book. 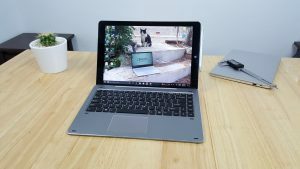 I have one that’s arriving today, minus the Keyboard Dock about a week behind it, to do reviews against, but I’ll be slow to review it myself as I’m also in the process of moving, but couldn’t resist giving it a test. friends, chuwi launch more new products at Global Sources Mobile Electronics. Have you tried Audio/Video over USB-C ? Yes looks like it works, then nothing. So no video support over type-c.
the first command’ as to put report on desktop and the second line “energy report”. 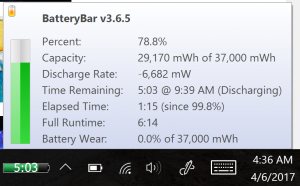 // it takes a little over an minute and then scroll down in the report and check the battery values…. My unit is on the way, and from your review i see its exactly what i expected. 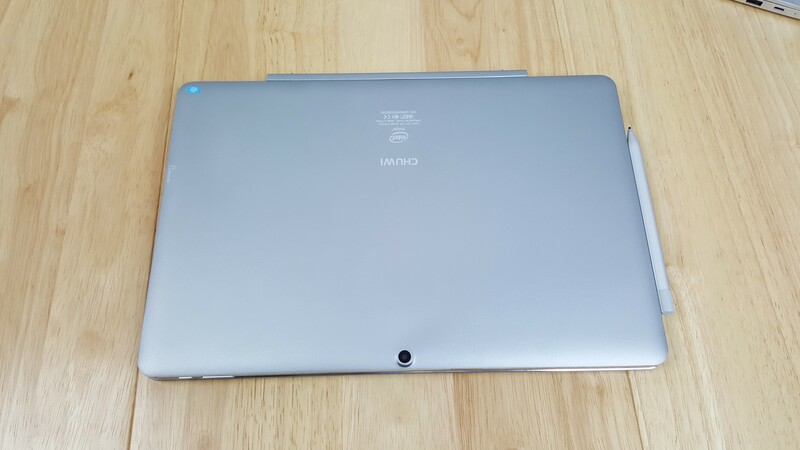 Im looking for a generic tempered glass for it, and i want to cover as much as possible. Any chance you can measure the screen size with and without the bezels? 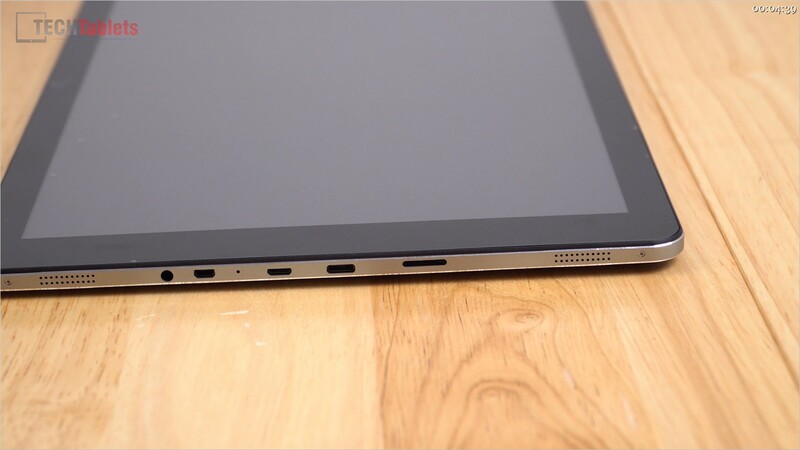 332mm wide, 219mm high is the screen protector (so with bezels) 285mm wide x 190mm screen only.